The traditional office space is dead. Chased out by the combining forces of mobility, millennials, and modernity, the advent of collaborative technology and the always connected worker have led to a brave new world of shared, open spaces. Studies show that up to 82% of knowledge workers feel they need to collaborate with others throughout the day to get work done. Yet, according to an IBM study, 78% say they struggle to effectively connect their workplace and help people collaborate—either virtually or face-to-face1. Why? The answer is not all collaboration is alike. 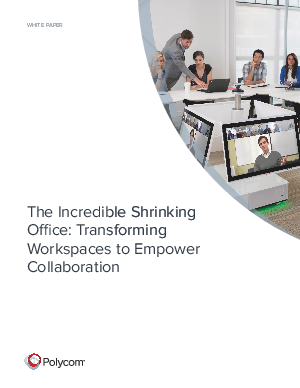 Download this report to get the latest trends in office space utilization and find out about the three main types of collaboration and how they need to be supported differently in the work environment. The office may be shrinking, but it’s not going away anytime soon. If anything, the rising demand for more teamwork and collaboration makes the configuration of workspaces more important than ever.